Like all of the couples that I work with, Ellie and Lance wanted digital files from their wedding day but were also hoping for something tangible that they could keep in their home. Many couples wonder what to with wedding pictures so that they can regularly see and share them with friends and family. Choosing something to hang on the wall (like a printed canvas, or a series of favorite framed images) lets you take your favorite wedding pictures (usually something that lovingly embodies one of your favorite memories from the day) and turn that image into real, printed, custom art for your home. So many good things come from this! You get to be sentimental and be inspired every day when you see a meaningful portrait that takes you back to a magical wedding moment, and you're decorating your home with beautiful art!! Everyone wins!! I met with Ellie and Lance a couple months before their wedding for a Wall Art Consult. They were kind enough to invite me into their home, and I brought along samples with all of my wall gallery styles so they could see my different frames and canvases in person. We talked about their typical decor style in their home and decided that a barnwood frame would be a good choice for them. We also took a picture of their bedroom where they wanted to hang the art (we taped a piece of paper to the wall so that I'd be able to calibrate the size of their room later). After a wedding, I show the couple their final wedding pictures in person about two weeks after their wedding. We go through all of their pictures, and then think about which parts of the day they'd like to choose portraits from to put on the wall. Ellie and Lance wanted to choose a portrait from their first look - once they saw each other for the first time that day, we spent a little time wandering around the Arboretum, and they had this beautiful moment in this wooden structure. 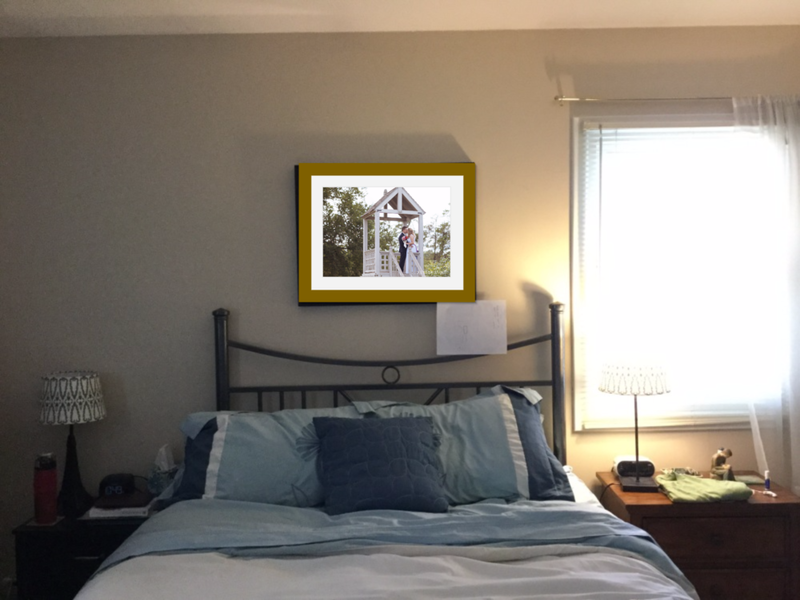 Ellie and Lance knew that they wanted to choose one picture to feature in a larger frame above their bed, so they selected one picture with a romantic, relaxed vibe. Here's the portrait they picked! With their favorite picture in mind, I pulled up the picture that we took of their bedroom back at their Wall Art Consultation. I have this cool photographer software that lets me import a picture of a room (with a sheet of letter-sized paper taped to a wall) and I calibrate the size of the room with the software. Then, we can easily design mockups of different wall gallery sizes and groupings. This is super helpful! It's so hard to imagine what a 24x36" frame or a 30x40" canvas looks like - being able to see it in the context of your wall makes it a stress-free process. The picture below shows the final mockup of their wall gallery with a medium sized frame. This size felt proportional with the size of their bed (if you're hanging something over a bed or large furniture, you typically want it to be 1/2 - 3/4 as wide as the furniture. This size is also large enough that we can clearly see their faces in the photograph, without being too large or overwhelming the space. With a couple easy decisions made, we had finalized their wall gallery design together in just a few minutes! Step four: install the art! I include complimentary wall gallery installation with any printed wall art purchase. I've found that having to hang up your own art can be a chore (you have to dig out a level and your tools and a measuring tape, or risk this fancy new art being all crooked and off-center) and I don't want to give my clients homework! :) So I deliver the art to your home and hang it up for you (I usually bring my partner Tyler, who used to work at an art museum and is super good and careful about properly hanging up art). Once Ellie and Lance's frame arrived, I was so excited to bring it to their home and hang it up in their room! These barnwood frames are one of my favorite wall gallery styles - they are handmade by artists in Louisiana from reclaimed barnwood - and they have two panes of glass that the photograph floats in between, so it's a frame style that is a really beautiful mix of natural/rustic and modern. They're really unique and custom, and an especially great fit for outdoor weddings. The extra magical part of this is that many of my frame/art suppliers print the art in just a couple weeks. So as quickly as a month after your wedding you can have beautiful printed photographs decorating your walls, inspiring your days. That's the stuff I love to do! Are you planning a wedding? If you love the idea of having some printed wedding photographs to hang on your walls, I would LOVE to talk with you! Click here to get in touch and we can see if we're a good fit for each other.